Some of the last additions to the ModuKey blogs showed a standing desk with three screens with a laptop as the low-center screen. This has been a convenient arrangement, but the screenshots have a lot of blank space. On the upper-left screen, I kept a diagram of all the keycap diagrams for the four different layers. On the bottom screen was the pjrc.com webpage with the recognized names for all the keys I was adding as well as the gaming software I was using to record software macros to make it easy to program each specific key. 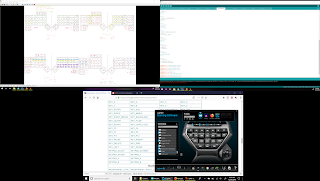 For the upper-right screen, the most convenient to look at, I kept the Arduino code I was working on. Writing a macro to replace my existing code with the new key assignments seemed like a better use of my time as opposed to painstakingly replacing each line while referencing the keymap back and forth. It may take more time in the long run, but it has not felt so tedious. The first two modules were programmed but the hardest part was the front loading where the macro was written, and a pattern was established for adding the rest of the keymaps.